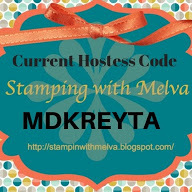 Stamp with Melva: It's Sale-a-Bration! and you can earn FREE product! It's Sale-a-Bration! and you can earn FREE product! I love it when Sale-a-Bration starts! 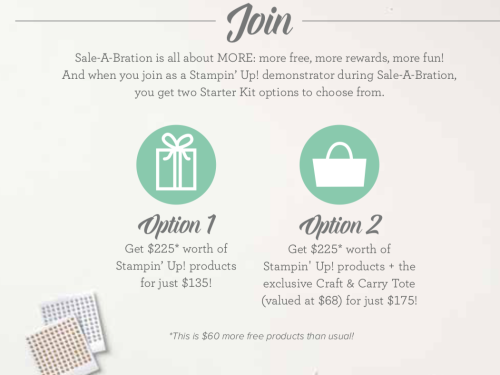 It means that you can earn free product for every $60 (before shipping and taxes) and who doesn't like to get something for free! If you haven't seen the new Occasions Catalogue or the Sale-a-Bration Brochure, you can take a look using the PDF's below or by going to my Online Store. Spend $180 and pick THREE Level 1's or One Level 2 and ONE Level 1...and so on! Spend $200 and you also receive Host Rewards. Spend (or host a party or gather orders from your friends) $300 and receive a bonus of $30 more Host Rewards! Do you have an order of $135? Have you thought about joining my team? You can pick your own Starter Kit items AND there is a bonus this year. If you choose Option 2 you will receive this amazing Tote. There may not be enough for the entire Sale-a-bration period so if you want Option 2 sign up sooner rather than later. I want to share one of my favourite stamp sets from the Sale-a-Bration Brochure - Home to Roost! I think this is going to be a favourite for many people. Check out this quick and easy card. 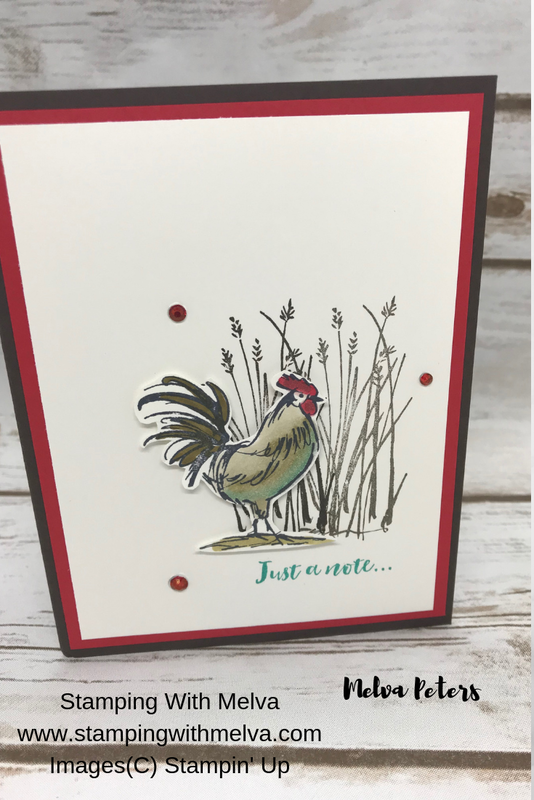 I used Early Espresso to stamp the rooster and stalks and Bermuda Bay to stamp the sentiment. I coloured the rooster using Soft Suede, Bermuda Bay and Poppy Parade Stampin' Blends. The card base is Early Espresso with Poppy Parade. I love how the Poppy Parade pops against the Early Espresso and then how the Bermuda Bay pops against those two colours. The final embellishment is Basic Rhinestones which I coloured with Dark Poppy Parade Stampin' Blends. It's so easy to create rhinestones to match any card colour! Check out the supply list for this card below. All of the supplies I used are available through my Online Store. My Occasions Catalogue and Sale-a-Bration Launch Party is this Saturday! Are you coming? I'd love to see you and show off some of the amazing new products from the Occasions Catalogue and Sale-a-Bration Brochure. I'll have card samples, make and takes and refreshments! Enter to win door prizes just for coming and get an additional entry when you place a qualifying order. Drop in anytime between 10am and 4pm, but please RSVP so that I have enough supplies for the Make and Take. If you haven't received the new catalogues, you can pick them up on 5th! If you can't make it on the 5th or don't live in the Ladysmith area, and haven't received the catalogue and SAB Brochure, please let me know and I'll send one to you. If you place a qualifying order Online using the Host Code MDKREYTA between January 3rd and January 7th, I'll send you the Make and Take card and the give away as well as entering you in the Door Prize draw!